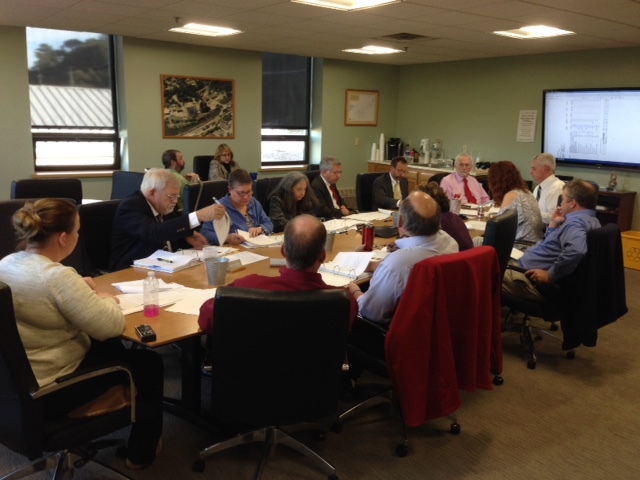 Members and staff of the Jamestown Board of Public Utilities during its October 2018 meeting. JAMESTOWN – The Jamestown Board of Public Utilities isn’t planning any rate increases for customers in any of its five utility divisions in 2019. That’s the news coming out of Monday’s BPU monthly board meeting, where the board approved the budgets for three divisions that were presented last month, while also reviewing the tentative budgets for the district’s two largest divisions – electric and water. The board unanimously approved the budgets for Wastewater, Solid Waste, and District Heating – noting that none of those three will include rate increase for customers. Meanwhile, the board went over the tentative numbers for both the water and electric divisions. BPU finance and customer accounts manager Kelly Hawkins said that while no rate increase is planned in 2019 for the water division, the board needs to be mindful of the system’s aging infrastructure, which could impact rates in future years beyond 2019. “The infrastructure continues to age and is a big concern in this division so, in 2019, we built in $500,000 of maintenance service replacements… but basically we are waiting to hear about a grant so that is really going to drive decision making after 2019 as far as what we do to decrease the age of the system,” Hawkins explained. Meanwhile for the electric division, the BPU is not allowed to increase electric rates without first getting permission from the state Public Service Commission. BPU General Manager David Leathers explained to the board that because some of the restricted and reserve funds used by the BPU continue to dwindle and it will be difficult to replenish with money from declining off-system sales, it may have to make a case to the PSC in the future for a rate increase. “If we’re not running the plant enough throughout the year then we’re not generating significant enough of off-system profits to even feed into [our restricted reserve funds], so there’s a lot of challenge and a lot of work ahead on those issues,” Leathers said. The board will likely act on the water and electric division budgets in during its November board meeting.